Ten years in, it isn’t always necessary for an artist to grow with each release, but it helps. 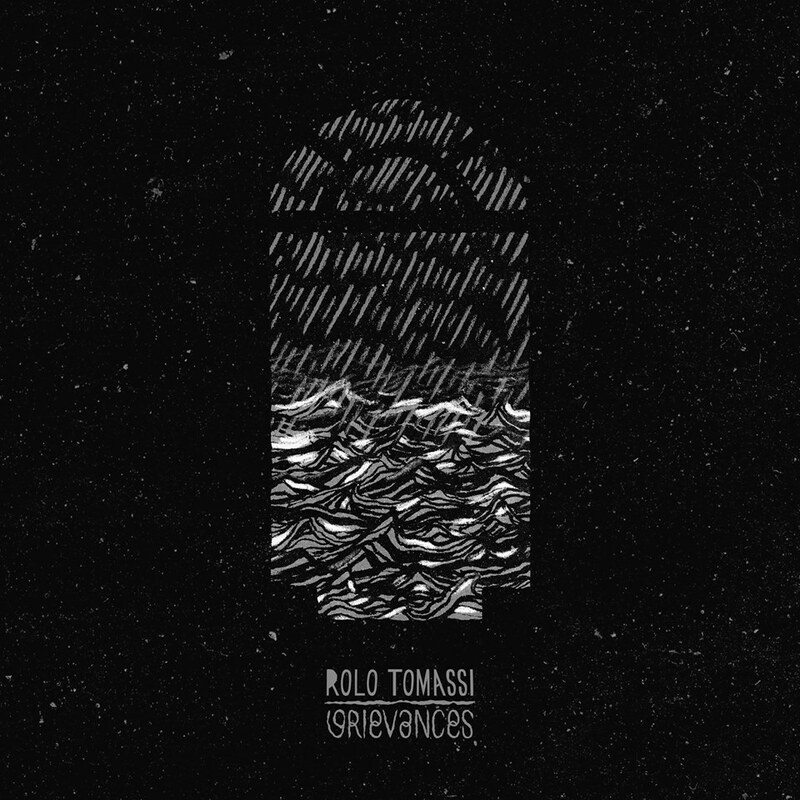 As a long time fan of Rolo Tomassi it’s a pleasure to see one of the UK’s most compelling bands continue to do so with fourth record Grievances, a release which further pushes boundaries and defines the band’s sound a decade in. That being said, only siblings Eva and James Spence have been present for the entire decade, with a change in personnel taking place before the release of 2012’s Astraea. Three years later the changes still seem to be benefitting the band’s music, and with Grievances Rolo Tomassi have released their best record to date, regardless of who’s put it together. On any release over the last ten years Rolo Tomassi have always played exciting, stimulating music. Sometimes it’s been played with a fierce, mathy intensity, whilst at others it’s taken a more gentle, progressive approach, but the music has always been pretty damn interesting. I remember first listening to debut LP Hysterics as a timid thirteen year old and being terrified, as weird as that sounds, but I can still listen to that record and realise why it got to me so much way back then, when my hair was really ginger and I used MSN. There are parts of Grievances which make me want to cower in their wake like that kid, and there are others which make me feel elated in a way that only soaring, layered music can. For a kid who used to listened to Jimmy Eat World and Green Day religiously to go to a record like Rolo’s debut was a jump, but having had the pleasure of watching the music evolve over the years it seems like an unsettling first step which has paid off tenfold for this listener. There are plenty of moments on Grievances which would bring out that thirteen year olds fear of the alien, menacing and unfamiliar, but at 21 I can enjoy how heavy tracks like The Embers and Stage Knives are. I can enjoy how at times the record sets me at ease, be it on the warmer Prelude III, which is content to meander as the Spence’s trade vocals, or on Opalescent, which is magic and melodic. At times Hysterics sounded rough, and the same could be said about Cosmology, and then less so about Astraea. I can’t bring myself to say the same of Grievances, which is brilliantly executed and crafted. It seems to pick up where Astraea left off but smoothes out the creases, and listening to it feels like listening to Rolo Tomassi at their breathtaking best. It’s a career high, as Eva Spence noted in a recent Rocksound interview, and it’s a high in general, a transporting record which goes to some dark places but never loses itself in them. Spence snarls her way through the more aggressive moments, and sings angelically through the more delicate ones, whilst the instrumentally backing is roaring or reserved, adapting to either with striking grace, often flitting between the two effortlessly. Emphatic second track Raumdeuter shifts between the pacifying and pummelling on a whim, featuring a section of tranquil techy downtime which could’ve slotted nicely onto Muse’s Black Holes And Revelations before then returning eclipsing and towering. Grievances is full of similarly huge instances, and it isn’t afraid to deliver them, and the second track seems to feature several of them. It’s a swirling maelstrom of musical creativity, and Rolo Tomassi have rarely sounded better, with the tracks brief opening shining the spotlight on new drummer Tom Pitts, who excels throughout. Maybe it’s because I’ve just finished watching Whiplash for the third time, but I found his addition to be hugely important to the records quality, matching its ambition and sometimes overtaking it. He brings the jazz-influenced Opalescent into life later on the record, and helps to make the song a highlight, with the track unfolding gradual and gorgeous, Spence’s clean vocals shining alongside a shimmering instrumental backing. The song showcases a more mature side to Rolo Tomassi, expansive and absorbing, and I couldn’t help but feel slightly let down when the song fades out whilst seemingly building to something monumental. There’s a six-minute period in the latter half of Grievances in which the predominantly cataclysmic nature of the first takes a backseat, and as a listener you’re given plenty of time to slip back into some sort of comfort. This spacious stretch comes across Crystal Cascades and Chandelier Silver, which carry the feel of a single long track as opposed to two shorter selections. Warm strings ease you into the former, which seems constantly ready to erupt but refuses not to, maintaining the records darker edge through this quality. It drifts via a starry soundscape on which James Spence leads vocally, asking ‘Are we cascading?’ as the synths in the background seem to suggest that we are, carrying the song onwards as lights flicker and Pitt pounds towards a peak which never comes. It’s a teasing, delicate track, but is far from dull, and as pianos see it out and into Chandelier Silver there’s a calm which lends itself well to the records abundant chaos. By the time the second track of this intermission (of sorts) rolls to an end you’re led into a false sense of security as to just where Grievances seems to be going as you draw nearer to its edge, and although Chandelier Silver seems perhaps unnecessary at the time it pays off when the thunderous Funeral dashes any feeling of complacency and rips it apart with Converge-stained teeth. It’s the quiet moments such as Chandelier Silver (despite being somewhat overdrawn on first listen) which make the fierce openers to tracks like brutal opener Estranged and schizophrenic The Embers hit even harder than they would originally, and the often tiptoed balance that Rolo Tomassi find throughout Grievances serves to highlights its strongest areas, which include its more minimal. It’s this element of Grievances, the implications of the unknown and unsettling, which I found particularly commendable, deliberate or not, and the shift in tone took full effect because I was wrapped up in the melancholy generated by the two songs sprawling out just before the abyss reared its head again. Although Astraea marked a notable progression to similar effect, there were still times where it didn’t manage to grip me, to surprise me in a sense, and even though I hold Astraea in high regard, after several listens Grievances feels like a much more exciting release, one which is a testament to how far Rolo Tomassi have come, not just as musicians, but as performers, and for a band who always put on a stellar show anyway that seems like a very good thing. One thing I’ve always come to expect from a Rolo record however is a grand finish, and Grievances certainly delivers in this capacity with All That Has Gone Before, which seems to offer everything a finale should – and then some. There are times when I’ve listened to the self titled closer on Cosmology and forgotten about the nine tracks that come before it, and this is the case here. The eleventh and final song on Grievances is the best, and across its seven minute length its constantly electrifying and suitably grandiose, changing shape and always changing into something better, the final minute a highlight as Spence’s cries of ‘We can’t be loved as we are / with the rise and set / I am nowhere’ stand strident atop barraging, bombarding instrumentals. Forty minutes after it began Grievances ends, the noise of the full band giving way to sombre keys, and then that’s it, and you’re left to fully take in what you’ve experienced, perhaps slightly shaken but satisfied anyway. The Spence’s, and whoever joins them, have always had a knack for writing tracks which are explosive, intricate and occasionally unnerving (as my younger self would testify) and very little has changed here. Their fourth record serves as their best, and it’s a result of several factors they’ve been honing often the years, resulting in a record which is as manic as it is mesmerising. Grievances certainly doesn’t hold back, nor should it, and come December it’ll go down, for me at least, as one of the year’s best – an experimental, invigorating and downright compelling release. Look past the grave artwork and you’ll find a record which is full of blistering life, and one which is wholly deserving of your time.